Under the tutelage of Rocky Balboa, heavyweight boxer Adonis Creed faces off against Viktor Drago, son of Ivan Drago. Back in 2015, Creed offered an expansion of the Rocky universe. Though the film didn’t dazzle at the box office, it did enough to inspire another chapter via 2018’s Creed II. Now the heavyweight champion, Adonis Creed (Michael B. Jordan) enjoys a good life, as he earns a fortune and plans to marry girlfriend Bianca Taylor (Tessa Thompson). 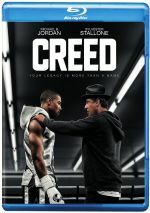 A new challenge comes Creed’s way when he receives an offer for a big payday if he fights up-and-coming Russian boxer Viktor Drago (Florian Munteanu). This deal comes with emotional baggage, as Viktor’s father Ivan (Dolph Lundgren) killed Creed’s dad Apollo in the ring decades earlier. Creed accepts the bout anyway, though mentor/trainer Rocky Balboa (Sylvester Stallone) refuses to participate. This leads to a mix of emotional ups and downs. On the surface, the inclusion of the Dragos seems like a cheap gimmick. I already thought the first Creed borrowed too much from the earlier films, as it often came across as a glorified remake of the first Rocky. With Baby Drago in tow, Creed II felt like it might evolve into little more than a reworking of 1985’s Rocky IV, the film that introduced Ivan. What comes next, a Creed III in which Adonis fights Clubber Lang Jr.? As executed here, however, the Dragos turn into the best aspect of the movie. Indeed, Creed II occasionally feels more invested in their tale, as it seems less concerned with Adonis, Rocky and Bianca. Not that this comes across via screentime, as we still spend most of the film with Adonis and his side. However, Creed II simply shows more life when the Dragos appear, partly because their story seems more compelling. I can’t claim Creed II treats the Dragos with particular creativity, as it basically posits Viktor as a kid with parental issues. Since his 1980s loss to Rocky left him persona non grata in the former USSR, Ivan uses Viktor as a path to redemption, and we learn mother Ludmilla (Brigitte Nielsen) abandoned both father and son after Ivan brought shame to the family. So Viktor follows a character path without real originality, as it seems somewhat basic and trite. Nonetheless, I like the chance to see what happened to Ivan after his defeat at Rocky’s hands, and the movie handles him well. To my surprise, Lundgren shows real dramatic chops. Over the years, the actor became something of a cut-rate Schwarzenegger, a piece of beefcake with limited acting skills. In Creed II, though, Lundgren delivers a strong performance, one that adds dramatic resonance. While the movie doesn’t give Viktor a huge arc, it does allow insight into Ivan, and Lundgren makes the most of these opportunities. A detailed discussion would involve spoilers, so I won’t say too much, but the movie’s finale allows real emotional punch, and most of it lands on the Drago side of the story. The narrative lets Ivan evolve in an unexpected way, and this seems moving. When Creed II concentrates on its title character, however, it feels less effective. Not that the movie becomes bad, but Creed II tends to follow paths that veer toward the trite side of the street. I’m not sure Rocky had enough inner life to merit exploration beyond the first movie, and that’s doubly true for Adonis, who seemed like a thin role even in his initial go-round. As I mentioned earlier, Creed came across like a semi-remake of Rocky, and one with a less compelling lead. Jordan, Thompson and Stallone do their best to elevate their roles, but they’re left as somewhat cliché on the page. We get developments that fail to surprise or add much unexpected to the project, and this borderline trite narrative ensures the characters don’t really go anywhere. Even the worst Rocky movies enjoyed excellent fight sequences, and Creed II continues that tradition. The various bouts offer dynamic action, and the climactic battle rivals anything in the franchise, as it brings a dynamic sequence. I just wish more of Creed II showed the same vigor as the fight scenes. Instead, it seems curiously disinterested in its title character and might be better if it’d been called Drago. Creed II appears in an aspect ratio of approximately 2.40:1 on this 4K UHD Disc. This became a positive representation of the source. Sharpness remained largely solid. Occasional softness hit some darker interior shots, but the majority of the movie showed nice clarity. No issues with jagged edges or shimmering occurred. Neither edge haloes nor print flaws marred the proceedings. A mix of teal, orange and amber represented the film’s palette. The Blu-ray rendered these well, as they seemed full and rich within the stylistic choices. The 4K UHD’s HDR added a bit of pep and zing to the hues as well. Blacks looked dark and tight, and shadows worked fine in general, though some low-light elements could be a smidgen dense. Contrast got a boost from the HDR. I thought the transfer became a quality reproduction of the material. Similar thoughts came with the movie’s involving Dolby Atmos soundtrack. Downconverted to Dolby TrueHD 7.1, the soundscape remained restrained in the many character scenes, but other elements burst to life in a prominent manner. As expected, boxing sequences added involvement, and other scenes also brought out some good information. Much of the movie remained chatty, though, so don’t expect a consistently vivid soundfield. Still, the mix offered a fine sense of settings and environments. Audio quality appeared positive, with concise, natural dialogue. Music sounded vibrant and full. Effects boasted fine accuracy and heft, with powerful bass when appropriate. The soundtrack did what it needed to do and became a solid auditory experience. How did the 4K UHD compare to the Blu-ray version? Audio remained identical, as both discs sported the same Dolby Atmos mix. As for the visuals, the 4K UHD boasted minor improvements in terms of sharpness, colors and brightness. However, I thought the upgrade wasn’t tremendous. I’d prefer to watch the 4K but I didn’t think it did a lot to better the Blu-ray. No extras appear on the 4K UHD itself, but the included Blu-ray copy boasts some materials, and we start with Fathers & Sons. It runs seven minutes, 16 seconds and includes notes from director Steven Caple Jr., co-writer/actor Sylvester Stallone, producer Irwin Winkler, former boxer Sugar Ray Leonard, boxer David Mijares, trainer David Paul, ring announcer Michael Buffer, and actors Dolph Lundgren, Michael B. Jordan, Florian Munteanu and Andre Ward. “Sons” looks at characters, story, and connections among boxing fathers/sons. The show lacks depth but it contributes a few useful insights. With Casting Viktor Drago, we get a five-minute, 43-second piece with Jordan, Buffer, Stallone, Lundgren, Munteanu, Caple, producer William Chartoff, stunt coordinator Danny Hernandez, and actor Tessa Thompson. As expected, we learn about Munteanu’s casting and performance. We get a few decent thoughts but mainly find praise for Munteanu. Next comes The Women of Creed II, a five-minute, 51-second reel with Thompson, Jordan, Leonard, Caple, and actor Phylicia Rashad. The show examines the movie’s main female roles/actors and becomes another passable overview. The Rocky Legacy lasts 15 minutes, one second and features Lundgren, Buffer, Caple, Jordan, Winkler, Rashad, Leonard, Stallone and Thompson. “Legacy” discusses the Rocky franchise. It does so in a highly promotional manner that lacks much substance. Four Deleted Scenes span a total of nine minutes, 46 seconds. These add character elements and they’re uncommonly good, as most offer useful information and/or emotional beats. The Blu-ray opens with ads for Shazam!, Fantastic Beasts: The Crimes of Grindelwald and Fighting With My Family. No trailer for Creed II appears here. 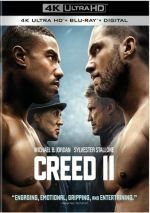 An erratic sequel, Creed II fares best when it focuses on its supporting roles. When it concentrates on the leads, it becomes less engaging. The 4K UHD brings very good picture and audio but it comes with mediocre supplements. Creed II delivers an inconsistent experience, though the 4K UHD presents it well.